It's hokey to say, but things really do turn from bad to worse in Simon and Zeke Hawkins 2013 indie crime thriller, Bad Turn Worse. B.J., Bobby, and Sue are high school kids about to break free from their dull small town Texas lives when all hell breaks loose. B.J. (Logan Huffman) takes it upon himself one night to break into his boss' safe and steal a handsome amount of cash to throw his two best friends the best going away party that he possibly can. Unfortunately for him, he drags his two closest allies into a dangerous game with a charismatic villain that will not stand for being made a fool. As the days drag on from his actions, B.J. 's forced to make his girlfriend Sue (Mackenzie Davis) and Bobby (Jeremy Allen White) partake in a heist that will replenish Giff's (Mark Pellegrino) stash, and then some. The two unwilling participants have no choice as their lives are on the line in this tense, suspenseful crime thriller. Alliances are tested, friendships walk on a razor's edge, and an inevitable love triangle forms as the pressure of B.J. 's actions gets to the three young adults whose toughest decision beforehand was what college would they be applying to. Pellegrino and Davis share some memorable scenes together on-screen, but overall steal the movie. Pellegrino's humorous lines mixed in with stone cold facial expressions make him pop off the screen and stick in your mind. He's maniacal, twisted, and downright ruthless, but entertaining until the very end. Davis, White, and Huffman are a great young cast and had excellent chemistry throughout the film. Personally, I felt Huffman's performance was fantastic as the troubled, lost soul who wanted more for himself, but knew where he was headed. Davis is an excellent up and coming actress who has nothing but a bright future lined up for her. Lastly, White is an underrated young actor who possesses great range and is emotionally engaging. While the story revolves around the young cast, being supported by veteran actors like Pellegrino, William Devane, and Jon Gries adds to the complexity of the story and extracts the best from all involved. Their presence on screen provides a maturity to the film that if it was not there may have taken away from the overall brilliance. 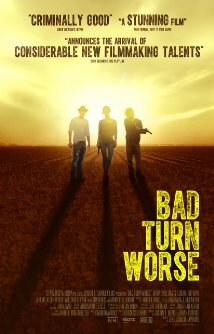 Stunningly shot in a great location with a talented cast, Bad Turn Worse certainly revitalizes the genre with an often used, but newly updated plot that modernizes the film. In the same vein as Brick, Bad Turn Worse revolves around an adult oriented story, putting the emphasis on the lives of the young protagonists and does not fail in creating an entertaining and engaging narrative.